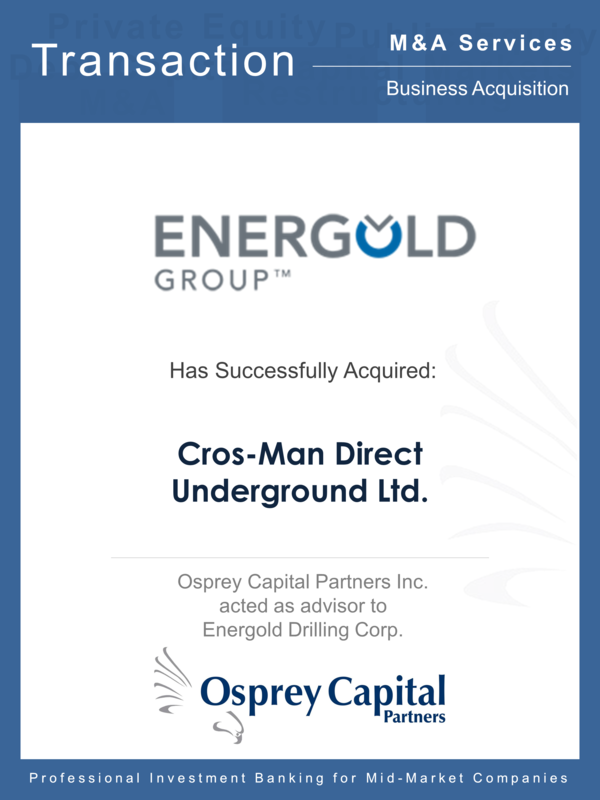 Osprey Capital Partners Inc. is pleased to announce that it assisted Energold Drilling Corp. in acquiring Manitoba based Cros-Man Direct Underground Ltd. Cros-Man, founded in 2005, is a horizontal directional driller servicing the telecommunications, water, sewage, hydro and oil and gas markets in central Canada. Cros-Man’s primary business involves the trenchless method of installing cable and piping systems underground in a shallow arc along a predetermined path, by the use of highly specialized drilling equipment. Over the past eleven years, Cros-Man has generated an increasing portion of its revenue from engineering and telecommunications drilling services and also maintains an ongoing presence in the oil and gas pipeline market in Central Canada. Energold Drilling Corp. is a leading global specialty drilling company that services the mining, energy, water, infrastructure and manufacturing sectors in approximately 25 countries. Specializing in a socially and environmentally sensitive approach to drilling, Energold provides a comprehensive range of drilling services from early stage exploration to mine site operations for all commodity sectors and has an established drill rig manufacturer, Dando Drilling International, based in the United Kingdom. Energold also holds 6.98 million shares of IMPACT Silver Corp., a silver producer in Mexico. 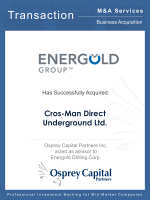 Osprey Capital was engaged by Energold to assist in sourcing an acquisition that would fit with Energold’s strategic objective to capitalize on the growing market for infrastructure drilling across Canada and the United States. “We are pleased to have successfully completed the acquisition of Cros-Man. The diversification of Energold’s revenue sources to include infrastructure is expected to dramatically scale operations of the Energold Group in its ongoing pursuit to become the leading specialty drilling services provider with above average returns,” said President and Chief Executive Officer, Fred Davidson.